Dave wants The Amp Hour to have a Loony Toons intro. Old Bugs Bunny cartoons used to have an entire orchestra. YouTube is giving $100K to develop a new series. Dave wants feedback on what he should develop. Chris suggested “dancing” + “soldering” and calling it “dancing with the scars”. 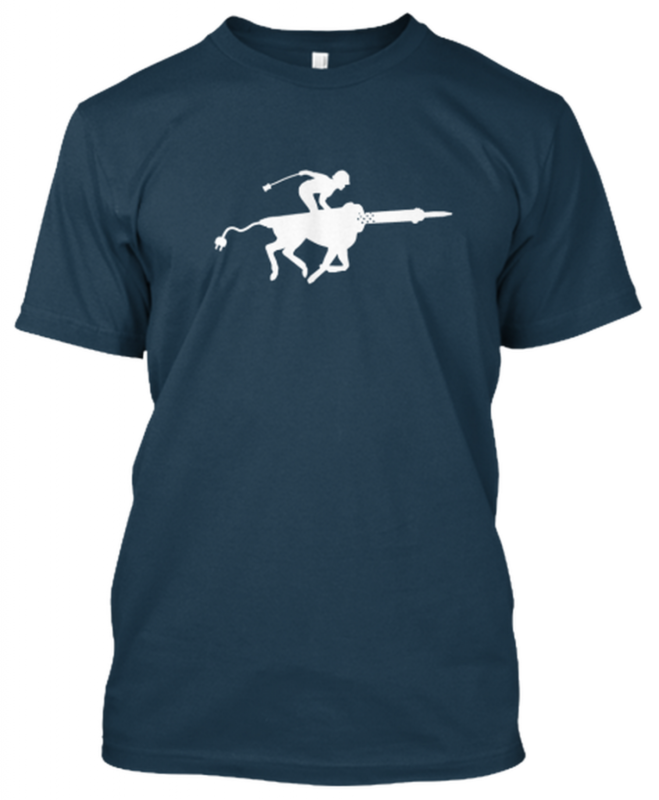 Chris has a new t-shirt design that represents a “solder jockey”. You can get one on Teespring. Chris has ben trying out the ESP8266 with a Teensy 3.1. Shaper (formerly Taktia) was even more impressive this year. Chris things it will change woodworking for novices. Carbide3D CNC machine was there, which has a great software tool flow (similar to other milling machine Othermill). The Nomad (by Carbide3D) also had a recent piece about milling boards beautifully. Chris also saw a TM-245 at a Seeed Studio event (they just opened an office in the bay area). Dave is getting an Inventibles X-carve (the smaller one). Radio Shack was noticeably absent from Maker Faire, and from paying back their small suppliers. 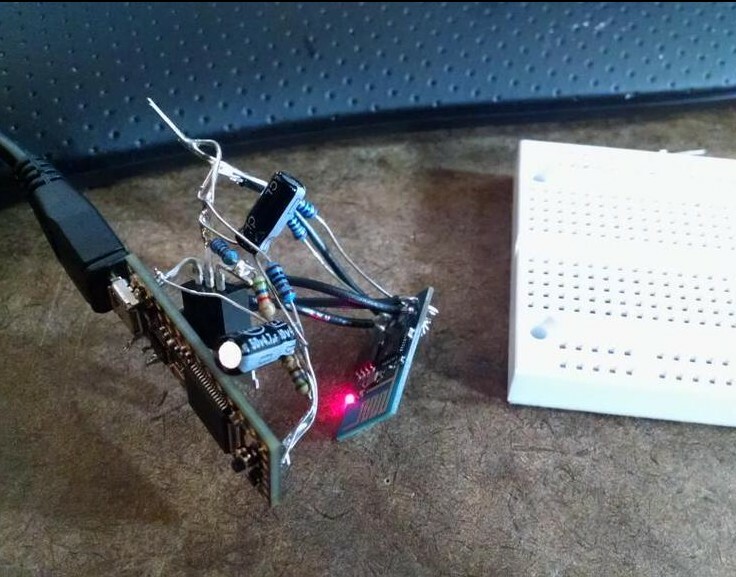 This year at Maker Faire, Google took over the “Learn to Solder” tent. As Chris mentioned, computing is basically free. New platforms like the CHiP and the Onion Omega make super powerful hardware ubiquitous. Dave backed the Lily quadcopter, recently announced. Vicash asked on our subreddit about the point of learning basic electronics. There are some great discussions on that thread. Chris stressed top down learning. After recording, Dave did and extended blab also about this topic. Dave has been trying out the Beta version of CircuitMaker, now mostly available to people. Dave also found that not committing projects allows them to stay “private”. Chris saw a talk by Adam and Matthew of Wayne and Layne about the future of KiCad at Maker Faire. Chris is looking for an embedded engineer to help out with Contextual Electronics (pay will be revenue sharing from member fees). Email chris at theamphour.com with the title “Contextual Electronics Embedded” if interested. This week turned out to be a jam packed episode! Please let us know what you thought in the comments! I have an idea for Dave’s web series, why not pick a failed Kickstarter campaign (engineering related of course) and help them relaunch it and make it successful. It can be like the ultimate guide for crowd funding, and he doesn’t have to travel outside to make it happen. With the money he can hire someone to film the progress in the other guy’s place or if it’s a local Dave can visit regularly. I just think it would be great to see the tips and advice he gives all the time in his videos applied to a real life scenario, and of course all the publicity around it wouldn’t hurt either. how it works, or how stuff works as in “everything engineering”, not just all electronics, or all renewable stuff ((can be too political)). how & Why of “everything engineering”. from driver-less cars or can robots ever be made to do house work?. or Artificial eyes that can let u see. ..6 mill dollar man . I don’t understand why so many people who call themselves makers or electronics hobbyists are so much focused on making money and starting their own business. How many people do electronics just for fun? Does every project have to turn into a polished Kickstarter campaign? The coclusion that the Maker movement 1.0 is dead only applies to the people who want to sell consumer gadgets. But there are so many other reasons to get involved in electronics and make stuff. Compare it to making clothes: of course you can buy a t-shirt for $3 that was made in some sweat shop in Bangladesh and it would be stupid to learn sewing in order to save money or to start a business. But you may want to have something highly customized or you want to create some work of art and something you can be proud of. That’s when you need the skills to make something and I think that is much more rewarding than money. In regards to a series of videos for the Google contest, how about a high level look on the open hardware, open software, DIY, and Small Manufacturing/ Hacker Space movement. Visit facilities, and interview the principles…Have an episode on each major category. #1. A segment on online vendors…Adafruit, Sparkfun, Polulu. Each year Sparkfun has a gathering where they race autonomous vehicles. #2. A segment on Drones: 3D-Robotics(Chris Anderson). Touch on the FPV and aerial photography craze.. Also, Australia has the OutBack Challenge. It’s a search and rescue competition every year using auto-piloted or remotely controlled camera equipped aircraft. #3. A segment on Computer Numeric Controlled Machines(CNC): 3-D printers, 3-D mills, PNP: Endless list…. #4. A segment on Components, Assembly, and Fab: Tour the Digikey Warehouse. Include OSHPark and interview Lane, and tour one of the FAB houses he uses to see the PCB manufacturing process up close. Adafruit Pick and Place. #5. Hardware Startups: All those little board manufactures that have sprung up from the Arduino, Wearables, Wireless, Watches, IOT. Those little educational magnetic systems that chain together etc. #7. Sensors: How the proliferation of cheap sensors is changing everything. How the Wii’ Numchuck Controller was turned into today’s flight control board. GPS, Proximity Control, Sonar, Touch screens…. Wearables and athletic equipment monitors, etc. #7. Hacker Spaces: Visit some of the larger hacker spaces and see interesting projects. Some of these spaces actually rent space to small private startups…see what’s going on there. #8. STEM. In light of these developments in the private sector, what’s happening in our public schools? Why are we not seeing STEM initiatives, that will bring these types of new courses, workshops/lab spaces into our high schools…just as we did with metal and woodshops in the past? Google Mesa Foam fighters. It’s a middle school where they are designing and building 3d foam airplanes with modern tools like CNC laser cutters. See the FliteTest YouTube channel for some videos on the Foam Fighters as well as the Foam Fighters YouTube Channel. Specifically with the EEVBlog and TheAmpHour…I’d like to see more segments on crowd-funding topics. Concentrate on the new offerings on Kickstarter and Indiegogo…like the IOT boards…3D printers…CNC mills…PNP machines. Look at the BOM, special moldings, and assembly costs each would require…and the likelihood of success. Actually, I could see a completely separate YouTube channel and forum that’s devoted to tracking technology projects on KickStarter and Indegogo. It would be the “Rotten Tomatoes” of tech crowdfunding. You could even have a cadre of your own reviewers…giving the project an initial thumbs-up or thumbs-down. And if the channel (through an intermediary) became a backer of specific projects, it could start a forum sticky-post…and over time, divulge the gist and trends of backer comments. In fact the actual backers could come over to vent on the forums. Then, a final end-product teardown/evaluation video could be performed, to look at the build quality, or lack thereof. Also, if software is part of the mix…what is the quality of the software? How easy is it to set up, flash, program, and run the entire product. What about maintainability? Are spare parts available?…or is this just a throwaway item. Just like solar roads…there’s just not enough policing of the crowd funding area. For example…this new TICO 3D printer at $170 in my estimation, has failure written all over it. Not even counting the electronics…there’s just too much involved, from custom molding, protective corrugated shipping cartons, shipping these bulky items from China…all for $170 a pop??? These are the kind of things that need to be examined with a jaundiced eye. Also you could start special topics. An example would be these new hot chips like the hot new ESP8266 WIFI chip…or…the worlds first $9 computer using something called the Allwinner A13 Compatible SOC Mali400GPU. Both these chips look pretty dodgy. The data sheets of both look like they were created of the back of a napkin. The datasheet for the Allwinner A13 Compatible SOC Mali400GPU…is all of 59 pages!!! The datasheet for the ESP8266 WIFI chip…is 23 pages of crap. The channel could explore how these chips are being made so cheaply, and what are the tradeoffs with using something like this. My take is that these chips maybe just fine for DIY experimenting, or learning to program… But to put them in any sort of product that requires a modicum reliability is foolish at best. People would eat up a Crowd Funding Oversite Website/YouTubeChannel/Forum. it didnt, you can preorder _one_(cant order more) with $15-20 shipping and $10-20 expander modules and MAAYBE get it in a year. Allwinner is EVIL, they routinely F GPL in the A, I wouldnt count on this thing ever having open firmware. For the show,add home automation and renewable energy..
Too bad the $100K youtube development deal is only for australian creators. A suggestion for a series of videos for the Google contest: Do an engineering documentary after the fashion of Tracy Kidder’s interesting book The Soul of a New Machine. In the late 1970’s Tracy Kidder would meet regularly with a small cadre of engineers working on the next great thing computer for their company. Kidder wasn’t a technologist, but he does his best to convey to the general reader the intricacies of developing a new minicomputer architecture. One of the endearing parts of the story development is the reader comes to know and care for individuals on the engineering team. (There is also a villian or two that gets dragged into the action as well). Dave could pick an Australian company with an engineering team working on some new killer hardware development project that will save the day and follow the team through a real world pressure cooker development schedule. The series could also take time to focus on interesting members of the team, their triumphs and disappointments. This has been done before with the most notable example of the U.S. Public Broadcasting Service series Nova doing an excellent show on Battle of the X-planes. In this show the film crew followed competing teams developing the next generation Jet fighter. A docu-drama of a real world engineering project would be fascinating for a broad spectrum of viewers–especially if well researched and crafted.